Debby Irving grew up in the very white and wealthy community of Winchester, MA. 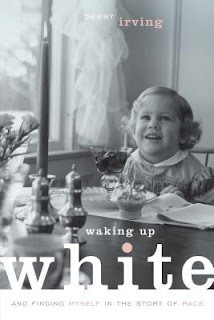 Being white was never something she thought much about, though she was concerned about diversity and race relations. In her career she tried to reach out to diverse populations, but she couldn't understand why her well-intentioned efforts kept failing. While taking a class at Wheelock college called "Racial and Cultural Identity," Irving had an "Aha!" moment that changed the course of her career and her life. She began examining her own white culture and privilege and has devoted herself to racial justice education. As a white person myself, I was very interested in this book and its promise of helping me understand how to be a better ally to people of color. I knew it was also a memoir, and I was happy to read about her discovery and analysis of her race and how it affects her worldview. Unfortunately, it was tedious and repetitive, and I got really tired of hearing about how privileged and entitled she was, without learning much that was helpful. Irving speaks about country clubs, unrelenting politeness, getting jobs and rent-controlled apartments because of family connections and refers to this all as white privilege. But they are all things that are completely alien to me and many, many other white people. She does a bit of lip service to class differences among white people, but I honestly felt like she just stuck that sentence in at the end, because she continued to muddy the waters by conflating white privilege and the privilege that comes from being wealthy through the entire book. Race and class are entwined, but they aren't the same. My issue with her treatment of these issues is that there is such a thing as white privilege, but she is conflating it with class privilege. The book was mostly about Irving's journey and was introspective and navel-gazey but provided little real insight or advice that would be helpful to other white people seeking to gain perspective on race. Repeatedly she pointed out situations where her privilege helped her or conversations where she made unintentionally problematic statements or situations that put up barriers to people of color, but didn't actually explain what about the situations or statements were racist, much less describe helpful alternatives that would have made more sense. This was very frustrating as it did not help me understand the issues at all. Only near the end - around the last 50 pages of the 250-page book - did I find the real meat of the book, and even that was fairly lean meat. For instance, at a conference when she asked a black man what he does for work, someone later explained to her that that question is a "social locater" and many people who aren't white Americans find it offensive. That was an insight that I found actually helpful, but she provided few alternatives of things to ask someone to get to know them. Likewise, in another section she presents a list of dominant white culture behaviors, such as conflict avoidance, defensiveness, and competitiveness, which I found rather enlightening, because I didn't realize these were not common traits in non-white culture. But it would have been much more helpful if it was more than just a list - some explanations or advice about beliefs and behaviors more common in other cultures would have been valuable. Here, as in several parts, she came quite close to laying out something concrete and helpful, but didn't quite get there. Near the end she mentions teaching a class called White People Challenging Racism at the Cambridge Center for Adult Education, a class I have seen listed in their course catalogue many times and sort of puzzled over and moved on. I'm much more intrigued by it now, because I'm very interested in the sorts of things she talks about in her book. I doubt I'll actually sign up for the class, but I'd be willing to read another book (or article - an article would be even better!) that provides actual advice on these topics. If you have suggestions, please leave them in the comments. I didn't dislike this as much as it sounds like I did. I definitely had to push myself through, but I found the topic interesting, it just didn't really deliver on its promises, and now I feel like I need something more.